Cinerama is a progressive jackpot game by Playtech released in 2013, with a 5×3 structure and 5 paylines. The game is obviously designed by someone with the appreciation for the 7th Art (which you probably already guessed) and all of the slot symbols are movie industry-related, starting from the base game symbols to the special set of icons such as Wild and Scatter. The Script, Reel, Film, Film Roll, Clapperboard, The Star, Megaphone Speaker, Reflector, and Microphone are the main symbols, whereas the Movie Camera is the slot’s Wild. The Headphones and The Director are the special icons, each activating one of the bonus rounds. The lines are adjustable and the bets range from $0.05 to $25, depending on the coin value selected and the number of activated lines. The RTP goes from 95.94-98.94%, which is solid but slightly lower than what some of the best Playtech slots have to offer. Movie-goers will be the first to fall for Cinerama’s cinematic charm, but even if you are indifferent to the theme, progressive jackpot and a great return to the player percentage rate of 98% will seal the deal. As a medium variance game, the slot will also appeal to all those who are not patient enough to endure long dry spins. The concept of bonus features is quite amusing and the players will have a lot of fun in their director’s chair, picking between the male actors for their leading man. Each of the characters is a so-called typecast actor and you can choose the one who is likely to fit your artistic vision and the genre of the movie you are making, be it King-Fu, Action, Horror, Crime, Comedy or Romance. The casting does not end there as you will get to select the leading ladies as well. A short biography is available for both the actors and the actresses, which should help you decide which couple is likely to create magic together and win you a movie award thanks to their mutual chemistry. A single set of Headphones anywhere on the reels is enough to trigger Bonus 1, where the players will get to test their business sense and predict which of the four movies will fare well at the box office. Fun bonuses aside, progressive jackpot will probably be the most appealing element of the game – anything other than the max bet will result in 10,000 coins for the combination of 5 Wild icons while pressing your bets will make you a winner of the total jackpot amount (for the same combination of symbols). Surprisingly, Cinerama does not offer any Free Spins or multipliers, which will disappoint a vast number of players. Another downside is having to push up your bets for a chance to win the entire progressive jackpot amount, although this is not uncommon with this type of slots. Considering the release date, the visual profile of the game is satisfactory. Fun, and above all, an affordable slot with an extremely low house edge which can produce decent payouts and trigger smaller jackpots on lower stakes and coin values. 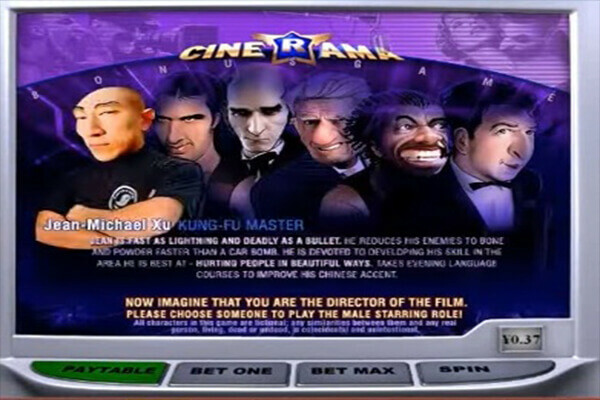 Even if you decide to go all in and increase your bets, Cinerama is not an expensive slot (at least not in its rank) and the winning hit frequency will ensure that you maintain an uninterrupted session and extend the gameplay time, which will increase your odds of hitting the progressive jackpot.